An adaptation of the popular manga by Junji Ito, Gyo: Tokyo Fish Attack centers around the "death stench", a revolting smell first encountered in connection with creatures appearing to be bizarre and aggressive mutant fish with scuttling, sharp metal legs. Yes, you read that right. Morbid manga master Junji Ito's putrid and surreal story of mutant zombie fish that sprout legs and attack Japan is possibly the maddest anime to come out of Japan since Urotsukidōji: Legend of the Overfiend. And this sounds to the uninitiated like cheapjack tosh, it's directed by Takayuki Hirao, who learned his craft as an anime director under the guidance of Paprika director, Satashi Kon. While in his early twenties, Hirao was entrusted to direct the first episode of Kon's first and only series, the critically acclaimed and frankly marvellous Paranoia Agent. Hirao has carved out a name for himself in the past decade as one of the young anime directors to watch out for, becoming known for his over the top action scenes and intense camerawork most notably in massively successful Death Note animated series. 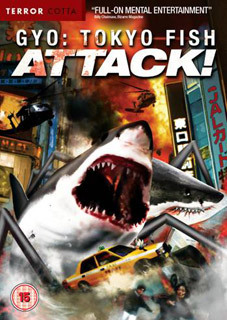 Gyo: Tokyo Fish Attack will be released on UK DVD on 20th August 2012 by Terror Cotta at the RRP of £9.99. The only listed extra feature is an interview with Manga master Junji Ito.